will also find the option to leave a donation. Thank you so very much and enjoy! Feel free to use any yarn or color you'd like but if you want the same monkey as pictured then use Red Heart Comfort yarn. Body, limbs and wings in Turquoise 3185. The vest and hat in Peacock 3193 and the red is Red Heart Super Saver in Cherry. RH Comfort yarn is a 100% acrylic knitting worsted weight yarn. Please use google to research if the yarn you are using is comparable. 4mm crochet hook. If you are making this to go with the set that I am currently still making some patterns for then use that hook size. If you are just making it by itself and it doesn't matter what size monkey you get then feel free to use another hook size. How to read the rows: Each row has a sequence as given below. Example: 1sc then 2sc in next st means repeat that sequence 1sc then 2sc in next st followed by 1sc then 2sc in next st over and over to the end of that particular row. The number inside the parentheses ( ~ ) is the number of stitches you should have at the end of that particular row. Work in continuous rounds. Add a marker to the last stitch and move the marker at the end of each row. *Click here for part 1 of the video tutorial which shows how to make all the parts. The video follows along with the order of the written pattern below except for the mouth which is shown last in the video. 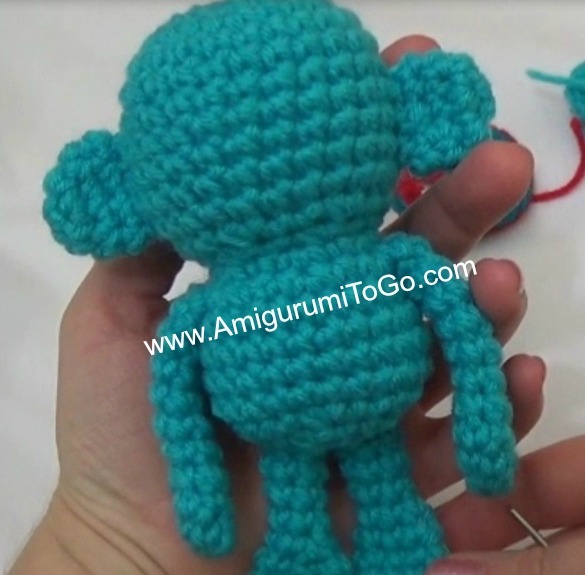 *Click here for part 2 of the video tutorial which shows how to sew the monkey together. For best results follow along in the same order that is shown in the video OR the order at the bottom of this post. 21) 1sc then 2tog (12) *Stuff body, make sure to stuff more into the head and neck area as needed. f/o leaving a tail for sewing. Weave in and out of the remaining st and pull tight to close *be sure to add in more stuffing as needed before you close the gap. Knot off and hide yarn tail in body. Muzzle and Mouth: Please feel free to change this part. You can use a felt patch instead, it doesn't have to be what I have here. I tried to keep the mouth simple. I was difficult finding a mouth to look right. After a few tries I decided to leave it as you see it. *In part one of the video I show how to make the mouth last. sl st and f/o leaving a tail for sewing. sl st next st and f/o leaving a long tail for sewing. Stuff with a pipe cleaner. 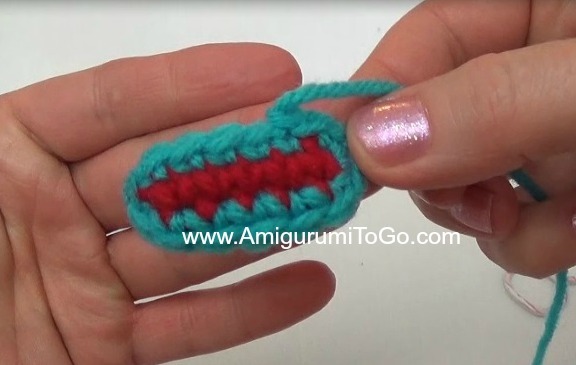 Fold pipe cleaner and loop the end that goes into the foot, twist the straight ends and cut to length but leave a little extra at the top that can be pushed into the body when you sew the legs in place. sl st next st and f/o leaving a long tail for sewing. Stuff with a folded pipe cleaner. This will help your monkey stand on its own. working now along the edge to the left of your last st, you'll have to push your hook through, 2tog then 2tog then 1sc in the outer loop of the corner. Next, working along the outer loops of the row, 1sc in each of the 11 outer loops. f/o leaving a long tail for sewing. Weave this yarn tail back along the edge, pull the wing out straight if it got bunched up while weaving the yarn tail. Put 2 wings together and whip stitch along the outer edges. View part 1 of the video for best results. f/o and weave in yarn tail or work the yarn tail into the next row. 5) we will now put a row of red all around the vest. View part 1 of the video tutorials if this part is confusing. Working now along the top edge first in each of the outer loops. Insert red yarn through the corner of the top of vest, on the side where you have 2 blue yarn tails, ch1 then 1sc in each of the loops across. When you get to the corner, ch1 and put 1sc into the next 3 spaces to the left. Once you reach the corner, ch1 and put a sc into each st across. When you get to the other corner, ch1 and put a sc into the next 3 spaces. f/o leaving a tail for sewing. Weave the yarn tail into a st or 2 to the left and pull tight to even out the edge then weave it back over the other way. You will use this yarn tail to sew the vest closed once it's on the monkey. *Pictured below is the vest I made with a lighter blue that I used in the video tutorial. sl st next st and f/o leaving a long tail for sewing. Using a strand of red, weave in and out around row 4, then put in a row of zig zags weaving in and out around the bottom edge. Knot of the 2 red yarn tails and tuck them inside the hat. The hat will be stuffed when you're ready to sew it on the head. 1) sew legs on. Pin them in place first to be sure you're leaving enough room for each leg. 4) sew the muzzle on. The top of the muzzle should be on or about the 8th row. 5) sew the buttons on above the muzzle with about 3 stitch holes between them. In the video I sew the buttons on last but you can sew them on after you sew on the muzzle. They are sitting on the 6th and 7th row. Using a regular sewing needle with a small loop of thread to pull the yarn through the button holes. I show how to do this part in the video as well, at the very end of part 2. 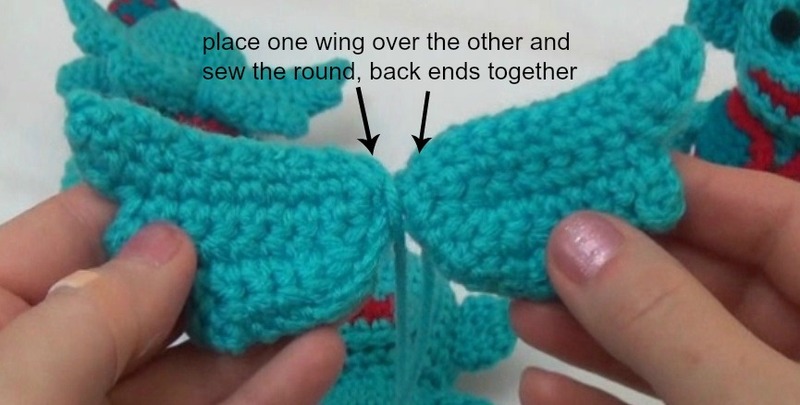 6) sew the wings together. Place one over the other then whip stitch the rounded back ends together. Then sew them to the vest. Make sure you sew them right side up. View part 2 of the video if this part is confusing. 7) put the vest on the monkey then sew the bottom halves of the vest together. Knot off and weave in yarn tail. 8) sew the tail on, it's just below the bottom edge of vest. 9) stuff and sew the hat in place. It should be just off to one side as pictured. And now you're done. I hope you enjoy your Flying Monkey! Post pictures on my facebook page Amigurumi Freely. Or post them on instagram with the hashtag Sharon_Ojala. Your flying monkeys are so funny. I think children will adore them. Hello! I've been working on a flying monkey for a Christmas gift for my aunt, and I just wanted to let you know, on the tail instructions I believe there is a typo! It says to 2sc in each st from rows 2-12, and in your video it says 1, which makes a whole lot more sense! The pattern is very easy to follow though and I'm glad you have a video tutorial for me to check back with in case I think I've done something wrong. I'm very new to Crochet and this pattern is excellent because I've been working on it on my own, but in case I second guess myself I have your video tutorial to look back on! Thank you so much! oh yes, thank you so much for letting me know. I've updated the pattern. Thank you so much for the kind words and I'm so happy you are enjoying the pattern. I love taking your patterns and making them my own by modifications but the base pattern is yours, thanks so much, don't worry when I sell them I give you credit on my tags.